NCP Nursing Care Plans for Common Cold. 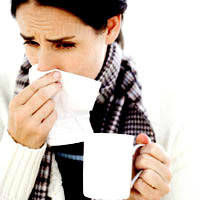 The common cold is an acute, usually afebrile, viral infection that causes inflammation of the upper respiratory tract. It's the most common infectious disease and is more prevalent in children, adolescent boys, and females. In temperate climates, it occurs more often in the colder months; in the tropics, during the rainy season. About 90% of colds stem from a viral infection of the upper respiratory tract passages and consequent mucous membrane inflammation. The most common causative agent is the rhinovirus; however, some colds result from Mycoplasma. Other offenders include coronaviruses, myxoviruses, adenoviruses, coxsackieviruses, and echoviruses. Assess patient’s exposure to others with the common cold. Patient usually complains of nasal congestion, headache, and burning, watery eyes. He may also report chills, myalgia, arthralgia, malaise, lethargy, and a hacking, nonproductive, or nocturnal cough. Most patients are afebrile, although fever may occur, especially in children.Clinical features develop more fully as the cold progresses. By the second day (in addition to initial symptoms), the patient may report a copious nasal discharge that often irritates the nose, adding to his discomfort. About 3 days after onset, major symptoms diminish, but congestion often persists for a week. Reinfection (with productive cough) is common, but complications are rare. • Inspection may reveal a reddened nose and eyes and nasal discharge. The nasal and pharyngeal mucous membranes may exhibit increased erythema, and the patient's voice may have a nasal quality. The skin around the nose may be excoriated because of frequent nose blowing. The patient will be free from pain. The patient will report increased energy. The patient will remain afebrile. The patient will expectorate sputum effectively. The patient will express feelings of comfort in maintaining air exchange. The patient will experience no further signs or symptoms of infection. Temperature Regulation: Attaining and/or maintaining body temperature within a normal range. Fever Treatment: Management of a patient with hyperpyrexia caused by nonenvironmental factors.